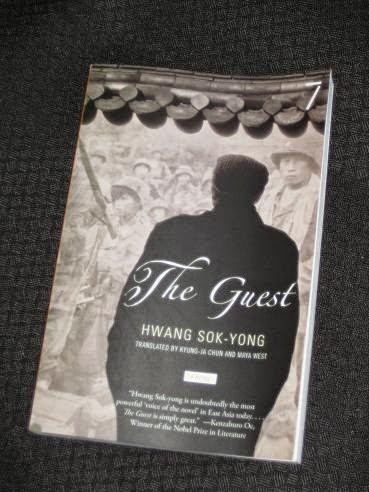 Hwang Sok-yong’s The Guest (translated by Kyung-Ja Chun and Maya West, review copy courtesy of Seven Stories Press) is an excellent novel focused on an atrocity which happened during the Korean War. The main character is Reverend Ryu Yosop, a Korean man who moved to the United States, escaping from the chaos left by the civil war. The Guest is a book which was met with dismay by the authorities on both sides of the border, and it’s little wonder considering the subject matter. It deals with a massacre in a collection of towns in the North in the middle of the Korean War, an incident which was blamed on the advancing American soldiers. However, it turns out that the murders were all carried out by Koreans, with Ryu Yohan being amongst the leaders of those carrying out the atrocities. It’s with as much trepidation as joy that the old man heads off to Korea. This is all due to what happened in the past, and the second strand, compiled from various eye-witness accounts, tells of the build-up to the massacre, before detailing the actions of those few horrific days. Hwang tells the reader about the slow rise of Christianity on the Korean peninsula, and the inevitable clash of cultures which was to occur when the Communists, supported by China, began to throw their weight about after the liberation from the Japanese at the end of the Second World War. The two imported ideologies, utterly incompatible, are the catalyst for a breakdown of the family- and community-based life the Koreans are accustomed to – the war is almost merely an excuse for the fighting to start. It’s a warning about the dangers of imported evils – and a premonition of what’s to come later. This sounds excellent Tony, I like the blend of good storytelling and evocative language with an insight into the past and cultural traditions and this one, going back to the North sounds like a revelation. There must be many stories like this in life I am sure, just two weeks ago I started teaching a new student who comes from Vietnam and so we talked a little about the country, one I loved when I visited it about 15 years ago. I learned she has has never been to the North of Vietnam, to Hanoi and would love to take her girls there, but her husband's memories of what happened to family during the war continue to be too overwhelming for it to be possible, it feels like a great tragedy to be held back psychologically from visiting a place that is tied so strongly to one's being, while millions of others visit it so freely. And made me wonder how many other untold stories like this are there. ← IFFP 2014 – Who’s Going to Win?